The Owens Corning® ELAMINATOR® Insulation System utilizes two series of machines designed to travel along the purlins dispensing faced insulation or facing from rolls: 100 Series and 300 Series. Used with Owens Corning® EcoTouch® Certified R Metal Building Insulation. 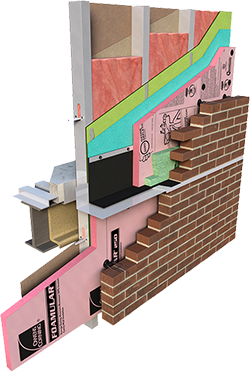 The Owens Corning® ELAMINATOR® Insulation System is used to insulate metal building roof assemblies (both standing seam and screw-down type) with fiberglass metal building insulation.